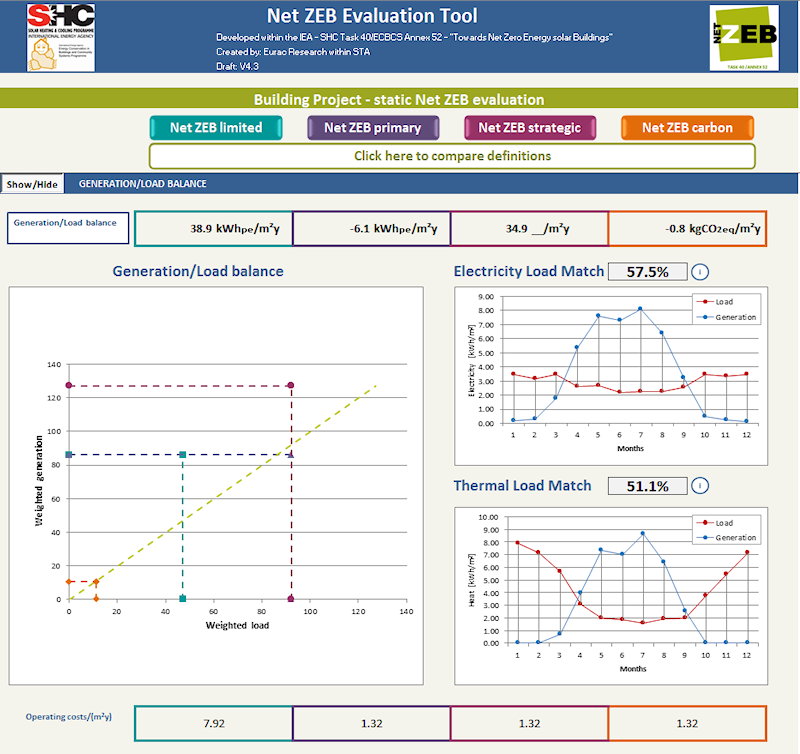 The Net ZEB evaluation tool is an excel-based tool that enables energy balance, operating cost and load match index calculation for predefined selected definitions. It aims at evaluating solutions adopted in building design with respect to different Net ZEB definitions (for building designers), assessing the balance in monitored buildings (for energy managers), and assisting the upcoming implementation process of Net ZEBs within the national normative framework (for decision makers). Please note that the tool has been developed within Microsoft Excel 2010 and there could be some incompatibilities with different excel versions. The tool development has been largely supported by all subtask A participants and tested by subtask C participants. A special thanks goes to Assunta Napolitano for activity coordination and scientific support until she worked in the Task 40/Annex 52 project. The EURAC contribution was supported by Stiftung Südtiroler Sparkasse funds. The German contributions were aided as part of the research initiative EnOB – Research for Energy-optimized Construction, in accordance with a decision of the Bundestag, by the German Federal Ministry of Economics and Technology.